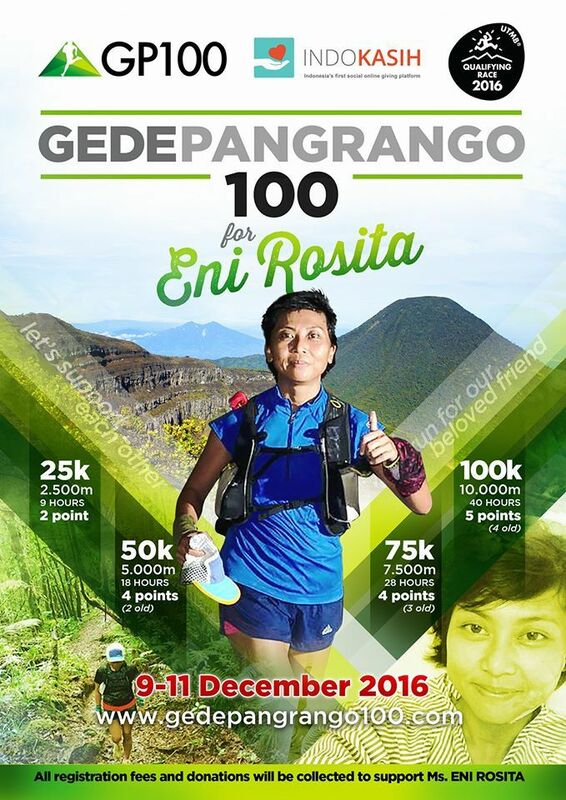 Gede Pangrango 100K 2016 | JustRunLah! This event is free, there is no registration fee to enter. Donations is open to participants, friends and public. GP100 is a free event, self-supported, community organized race, a great end of year challenge, with UTMB points to be earned. Last year, we encourage donation from participants, and their generous contribution had helped sending Aris Sopiandi to the big UTMB race. This year we are doing it differently. As we all know, our fellow trail runner, Eni Rosita, was met with a shocking incident that left her with trauma that will take months to recover. She’s currently undergoing a few rounds of surgery and treatment at Siloam Hospital in Karawaci, Tangerang. Our thoughts are always with her, and here’s wishing her a speedy recovery, and be back on her feet soon, strong woman that she is. Let’s get together again and show our support to Eni Rosita.